Experts tell us that employee satisfaction and customer satisfaction go hand in hand. At Belmont Village, it starts with leadership. Our community teams are trained to lead through service, to empower each other, to lead by doing, and to have fun. The results of our efforts are encouraging and we measure them each year in an extensive survey of residents, families and staff, organized by Sensight, one of the country’s leading independent survey firms. We are proud to report that Belmont Village ranks among the top U.S. providers in satisfaction scores, both as a provider and as an employer. We are delighted to share a few of our favorite responses from our 2015 surveys of all Belmont Village communities. 95.7% Residents / 97% Families – I/we are given opportunities to build friendships with other residents. 94.1% Residents / 96.1% Families – I/we would recommend Belmont Village as a good place to live. 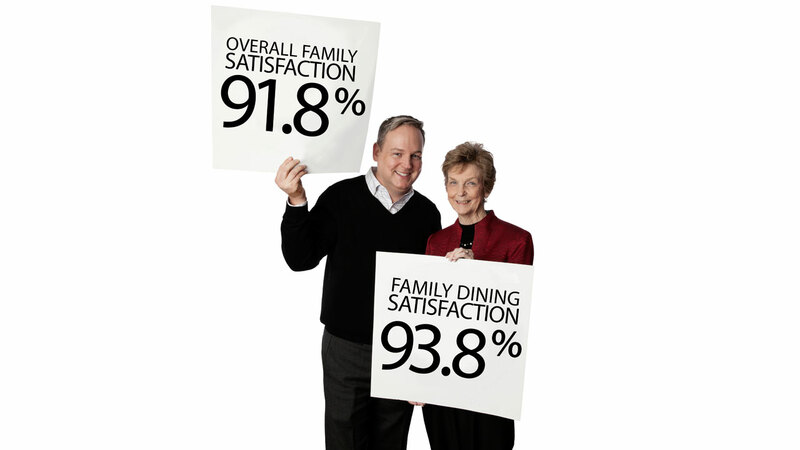 93.1% Residents / 93.8% Families –Dining room service team is attentive to needs. 96.0% Residents / 95.3% Families – Health care needs are being met. 92.8% – I would gladly recommend Belmont as a good place to work. 87.1% –I get accomplishment from working at Belmont. 86.7% – Overall, I am very satisfied with Belmont Village.